Moving is a daunting process under ideal circumstances. For children, who usually have no choice about whether and where they’re going, it can be especially difficult. Enter Valérie Besanceney’s My Moving Booklet. This interactive workbook, the result of years of experience with children of expats and other mobile families, is filled with exercises and prompts for children to complete with help from their family, friends, and teachers. With playful illustrations by Agnes Loonstra, My Moving Booklet is designed to help children anticipate challenges, cope with fear and uncertainty, and discover the rewards of moving. The first third of My Moving Booklet focuses on the reader’s current home, school, friends, and activities. A personal profile includes information about family, friends, school, ideas of home, rituals and traditions. Each section helps children explore and review who they are and where they come from, with space to draw or paste relevant pictures. Besanceney also introduces her fictional memoir B at Home: Emma Moves Again, excerpts of which appear throughout the book. The middle section deals with the move itself, including reasons for relocating, moving pros and cons, geography, and lists of things to do. Besanceney validates kids’ concerns while helping them identify and process their thoughts and feelings. She also empowers them to participate in the transition by listing items they want to take with them, places they want to visit before leaving, and people they want to say goodbye to. There is space to draw or paste pictures and maps, as well as messages from teachers, classmates, and friends. Finally, the last third of My Moving Booklet focuses on children’s experiences after relocating. Prompts and exercises cover the reader’s new home, neighborhood, school, friends, and activities, as well as things they still look forward to doing in their new location. Besanceney encourages kids to keep in touch with their old friends, whose contact info and birthdays can be found along with their farewell messages. In closing, she asks children what they’ve learned about moving and the meaning of home. 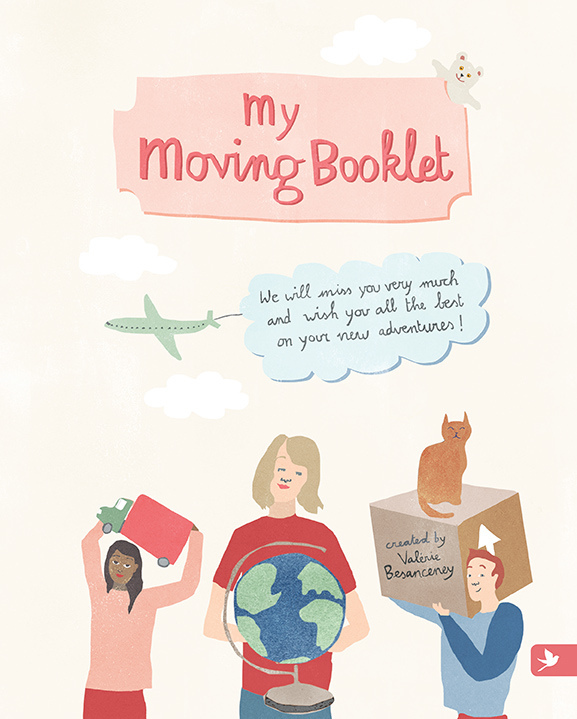 With prompts and space dedicated to passports held, languages spoken, and world geography, My Moving Booklet is geared toward children moving internationally or across cultures. Similarly, content focused on school, classmates, and teachers is aimed at children who attend regular schools. However, homeschoolers and those moving locally can still benefit from My Moving Booklet by tweaking or skipping these sections. Moving is a challenge at any age. My Moving Booklet—a combined roadmap, field guide, conversation starter, and keepsake—has the potential to transform children’s experiences of moving from turbulent upheavals to manageable transitions. Instead of feeling helplessly uprooted, they can prepare for coming changes, say goodbye to their old home and friends, and appreciate the new adventures that await them. Thank you for this article . It is so very important to help parents with this topic especially in an ever changing population like Luxembourg .